In my continuing efforts to stop the addition of sugary tastes to every single thing we eat as Americans, I make berry vinegars. They are lovely as salad dressings, of course, but I find they add a pang of lost love to root vegetables, soups, and meat deglazes, a haunting undertone that speaks of berries gone by. 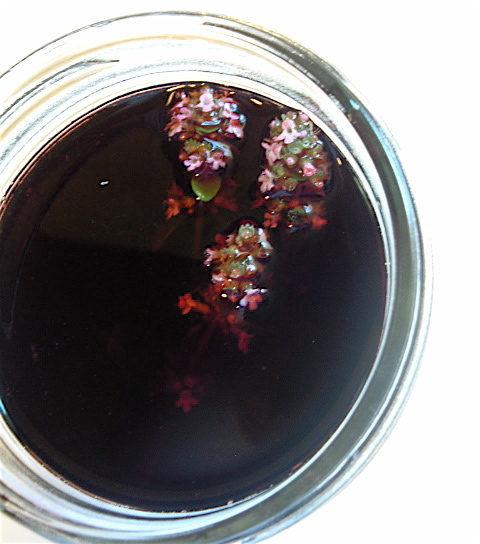 By far, the simplest concoction I’ve brewed up is marionberry-thyme vinegar. I put up a mason jar or two during blackberry season, using fresh berries or berry pulp I have left over from making jam, but it is completely acceptable to make the vinegar in the end days of fall from frozen berries. When berries freeze and thaw, their cellular structure is compromised, so they release their juices into the vinegar easily and thoroughly. The method is easy and offers endless creative possibilities: fill your clean jar with no more than a third with blackberries, add three fresh sprigs of thyme and a half-dozen black peppercorns, and top off with white wine vinegar. You may subsitute other berries or herbs. Use a plastic cap, since metal jar lids will rust with the acidity of the vinegar. (I use the white plastic lids they sell with canning supplies.) Let sit in a dark, creepy place for a month or so before using, shaking gently once every other day for the first week or so. To normal people, this looks like a perfectly gorgeous fall-colored side dish of roasted Chioggia beets and yellow peppers dressed in a vinaigrette with thyme leaves…with a blackberry garnish? But to those of us with vinegary agendas, it’s an explosion of dark, earthy, smoky, piquant flavors. 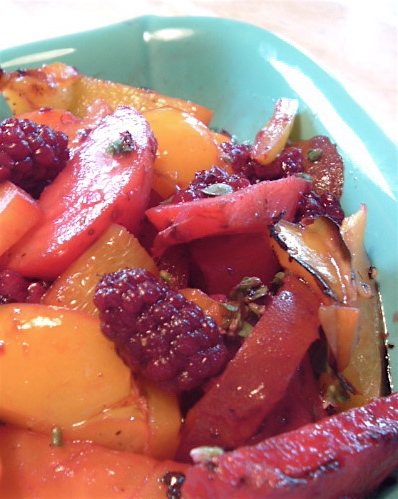 The pickled blackberries work as counterpoint to the caramelized sugars in the beets and the peppers, and the fresh thyme sprinkled on top picks up the thyme notes in the vinaigrette. It’s a sophisticated mix of tastes, and gorgeous to boot if you use multi-colored beets and peppers. This dish is like Harvard beets (sweet and sour boiled beets, pickled with onions and lots of sugar) on steroids, and prettier than that old battleaxe. Try berry vinegars whisked together with olive oil over any sweet root vegetable, and let me know what you think! What a great idea to use with root vegetables. I have several jars of vinegar I’ve made this summer and I’ve been enjoying salads with the blueberry basil vinegar. I’ll definitely try this or the strawberry vinegar with roasted veggies. Ooh, I bet the strawberry would be good.